. . . . . . . Selimut-ku . . . . . . .: X-mas Ornament : Angels.
. . . . . . . Selimut-ku . . . . . . .
You know what's a great gift you can give for your friends or family? I think something that you make by yourself will be a great gift .. 2 months until Christmas.. Still have a lot of time! I don't celebrate Christmas but I just love to share an idea for those who celebrate it, especially for my quilting friends.. (I forgot where I've seen this angel ornament, but I do remember how it looks). 2 Different of fabrics 15cm x 15cm (robes). 2 Felt 12cm x 14 cm (wings). 1 Broken white fabric 8cm x 8cm (head). 1 Felt 4cm x 4cm (head). Gold ribbon & gold thread. Have you seen "You've Got Mail"? I watched that movie more then a hundred times (LOL). 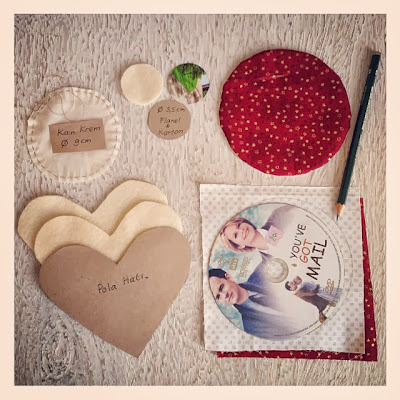 This morning, I used my favorite movie CD as a template then I turn it on in the CD player and I watched Tom Hank and Meg Ryan again and continued my crafting. To make a circle for the angle's robes, find tutorial here. Fold collar for the robes and stitch together in the middle. 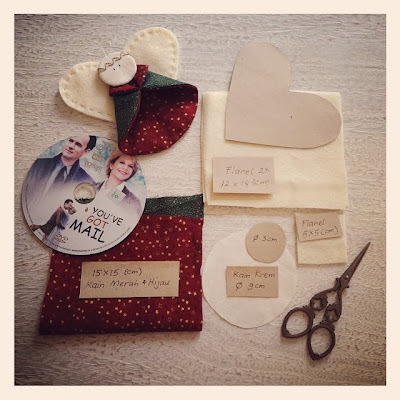 Sew 2 heart shape of felt with running stitch to make angel's wings. For the head make yo-yo and fill it with felt and cardboard. 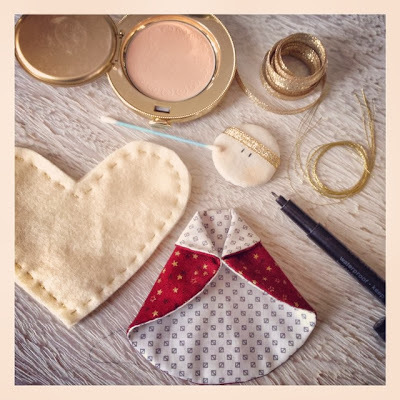 Put ribbon on the head, draw eyes (used waterproof pen) and give a little face powder on the cheek. Put the robes on the wing and the head on upper of the collar. You can sew or use glue to put them together. 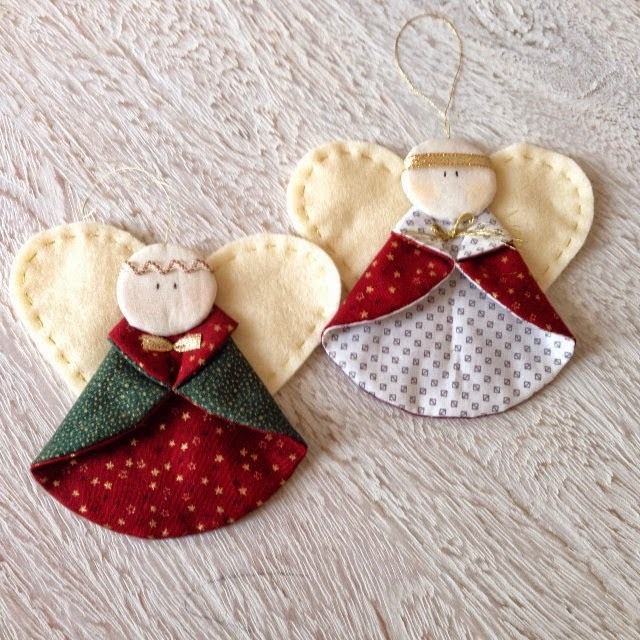 Sew a long thread on the top of the head to hang these cute angels on your christmas tree. Does anyone have any suggestion for a permanent cheek color. I'm trying to add this to a quilt block. These angels are adorable! Thanks for sharing the tute! Che simpatica idea! Grazie per la condivisione! Excellent post share with us and this blog is impresses more people to reading that blog. This is really a amazing blog. I am very glad to read your great blog. whatever you share information in you blog,this is so interesting for me. I get a such great update from you side. Thanks alots! Good post. It is really helpful to us. Its give us lots of interest and pleasure. Its opportunity are so amazing and working so speedy. Its really a great article. Thank you for your wonderful inspiration! I used it to create an angel for a customer out of her father's shirt. How lovely. Also I love the fact that although you don't celebrate Christmas you have included this tutorial for us all. Sharing is fantastic. This would be a nice memory ornament using loved ones clothing (for robes). Leaving this as I keep seeing unwanted spam posts which have nothing whatsoever to do with crafting. Wow, after reading this post I can clearly tell that this year’s Christmas will be better and bigger after coming across this site. 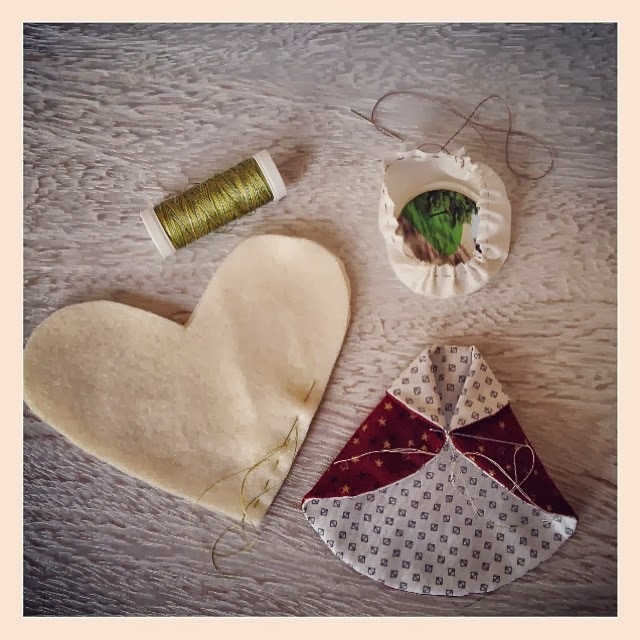 I will be sharing the links of this site with my colleagues so that they can also learn how to make the Christmas ornaments and practice making them when Christmas comes and students should Pay someone to Finish case Study assignments so that they don’t miss the Christmas celebrations. Oh my goodness! These are THE cutest! Thank you for sharing w/instructions. I plan to make some of these angels. 1) In the list of materials needed, you use the metric system, but in directions, you use imperial. It would be best to use both, or only one system throughout. In other words, be consistent. 2) Two "different of" fabrics? You could say either "two different fabrics" or "two different colours, or patterns of fabric"
3) What is Broken white fabric? Is this a brand name or a type of fabric? An Intenet search was not helpful. I wonder if this is due to translation and what is meant is "a scrap of fabric" as that makes more sense. 4) Add the step of cutting the cardboard template for the head. The size of this piece is given only in the list of materials, not with construction details. 5) Where is the template for the heart? 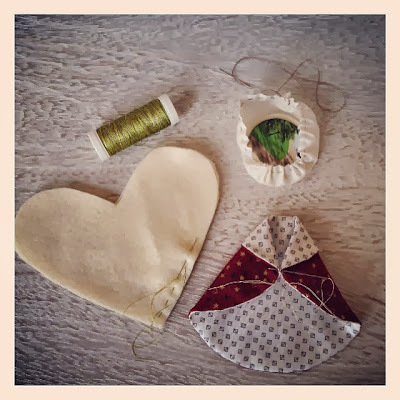 6) "Sew two heart shape of felt" should be "Sew two heart-shaped pieces of felt"
7) "For the head make yo-yo (you assume readers know what a yo-yo is) and fill with felt?? Don't you mean a tiny bit of fibre-fill? The craft idea is a good one. It is important to have someone proofread instructions before posting a tutorial. I love these angels! I will be hosting a sewing group this month and these will be the feature craft. Thank you so much! This is really an amazing blog.It's really a great article.It is really helpful to us.I really enjoyed reading it.I am impressed by this post.Thank you so much for sharing this post. One of the factors that makes students apprehensive of assignment help onlineis the cost of the service. Most of the assignment help seekers think that online assignment writingis an expensive affair. onsidering the budget of students towards assignment help, we have created our pricing plan with irrespective of the disparity in academic levels. Enjoy affordable assignment help service from the best assignment helpers. You can avail assignment help in Singapore, New Zealand, Canada, Australia, the US and rest of the world. Can anyone do my assignment for me in USA? Yes, we at Bighomework.com help you to do your homework on Accounting, Economics, MBA, Finance, English, and Statistics. Call us!! Това е една от големите статии. Благодарим ви за споделянето. Желая ви късмет и успех! from Assignment Help for academic writing services. Mom of two teenagers who grow together in happiness in the warmth of a simple home. Fun Project in a Rainy Day: Pretty Table Runner.